For the entire team at Fox Sports, the 2018 World Cup is the culmination of years of effort, planning, and dreaming. 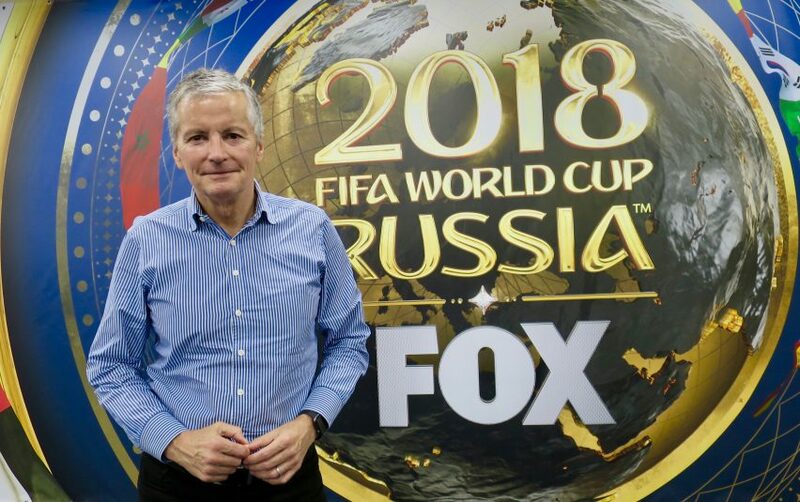 David Neal, executive producer, FIFA World Cup, Fox Sports, has overseen just about all of it since joining Fox in 2012. He has drawn on all the skills he has acquired in a career spanning nearly four decades, his work on nine Olympics for NBC Sports being the key to understanding the world of global sports-event coverage. Neal sat down with SVG to discuss the journey to Russia, the accomplishments, the challenges, and more. Now that you are here at the World Cup, how does it compare with an Olympics? It’s very similar to the Olympics, and the big difference is, it is one sport. With the Olympics, you are juggling all of the different venues, and part of your daily task is to orient the viewers to what they are going to see that day. Here, viewers know what they are coming in for, and that is world-class soccer. So that’s a big difference. But the pacing of yourself is very similar. I remember, at the Olympics, you would hit that middle weekend, around day eight, and then that second week would just drag sometimes. But, here, the first 15 days is really a cycle that is unending. The lucky part is, those 15 days are when everybody is freshest. We would have our production meetings at the hotel at 8 a.m. and then be here until midnight and then go back to the hotel and come back. And I guess one thing about the Olympics is, there is no slowing down towards the end, whereas, with the World Cup, there are many fewer matches in the last two weeks than in the first two. It was amazing to think, the other day, that, when the Group Stage ended, we had already done 50 games. You look back on them, and they are a blur. So, now, when people are probably a little more fatigued, the rest days develop, and I think that’s a good thing. One of the big things coming in was not having the U.S. team here. How did that impact preparation, and what are the pros and cons? I think it has made us more global, and, since October, we have said we now focus on all 32 teams plus Russia the country. And I honestly think that, as the planets have aligned in this tournament, and it has become a tournament of upsets that doesn’t follow form, the viewership numbers at home show that it is resonating with viewers. They love seeing something like Japan making a run at Belgium and then Belgium showing world-class form to win. And it’s funny: I read a few things in industry publications the day after we lost Ronaldo and Messi in the same day that it would be terrible news for Fox. Then, the next day, the two matches go to PKs, and those were our two highest-rated days of the event so far. The dividend from our not having to plan for the U.S. team is, we have been more open to the entire picture. I think we have been better able to tell the stories of all these countries that don’t have the red, white, and blue in them. And we are more well-rounded as a production unit because we had to look at the whole field. It gives us a broader canvas to paint on. [Fox Sports Senior Coordinating Producer, Features,] Jen Pransky sent me a note that her unit has sent out more than 300 different production elements and none of them have had the stars and stripes in them. It’s not what we planned for, but the dividends are paying off as we get deeper into this tournament and we still have brand names like England, Brazil, and France. I think we are doing a better job than maybe we would have otherwise. What are some of the lessons with things like streaming that have allowed people to tune in from anywhere? It’s like night and day. The streaming nature and availability of everything we are doing has been a game-changer. And now that we are able to combine numbers so that you get a sense of overall views, it’s not just the TV viewers but online as well. When you aggregate that number, it is pretty breathtaking. This tournament, this format, and this sport are ideally suited for a more robust streaming environment. The time zones force a lot of people during the day, when they are trying to get some work done, to keep an eye on the tournament. But technology has made it much more reliable, and, if someone has a moment to watch the match at 10:30 at their desk, the technology is not going to be a problem. Even just four years ago, there is evidence that it wasn’t that easy to do: it wasn’t just one app or one button; you had to jump through two or three hoops. But now the Fox Sports app is so well-developed that it is one button, and that is hugely important. What has it been like working with HBS and FIFA? You worked with them on the Women’s World Cup and Confederations Cup, but what has this tournament been like? HBS is the gold standard, they absolutely are. From [CEO] Francis Tellier to [Chief Content Officer] Dan Miowdownik to [CTO] Jörg Sander, they understand television and how it can showcase the sport better than anybody. One of the big differences between the Olympics and the World Cup is that, at the Olympics, if we wanted to put 15 cameras in swimming because we wanted to see everything Michael Phelps did, the IOC didn’t care. But here it is the exact opposite: FIFA wants the same game coverage to be seen around the world. And, frankly, when you look at the pictures that HBS is cranking out, why wouldn’t you want that? They have 37 cameras at every venue, so it would be preposterous for us to try to intercut our own cameras and replays when they are giving everyone such a high level of reliable coverage. I have spoken with some football directors at the EPL about the risks of trying to cut in a unilateral camera, and they say the risks are too great because you might not be able to cut out of it and could miss something. It’s true. And they call their production team the dream team, and it’s true. Our announce team has come to understand the reliability and predictability of the coverage pattern so that, not only when there is a goal scored but when there is a foul or any sort of controversial play, they start talking about a replay with confidence, knowing that something is coming from HBS. How does not having to worry about the core product change the way your team operates and their energy? It allows us to create our own identity and footprint in the studios and the shoulder programming because, obviously, the only thing we can do on the games is put our voices on it and control the drop-downs. But FIFA and HBS encourage us to make our studio facilities fit and suit our needs. We are the only ones in Red Square with our own footprint, and that came about because we expressed to them how important that was to us. It was very important to us to have our own location and our own environment for what our viewers expect. 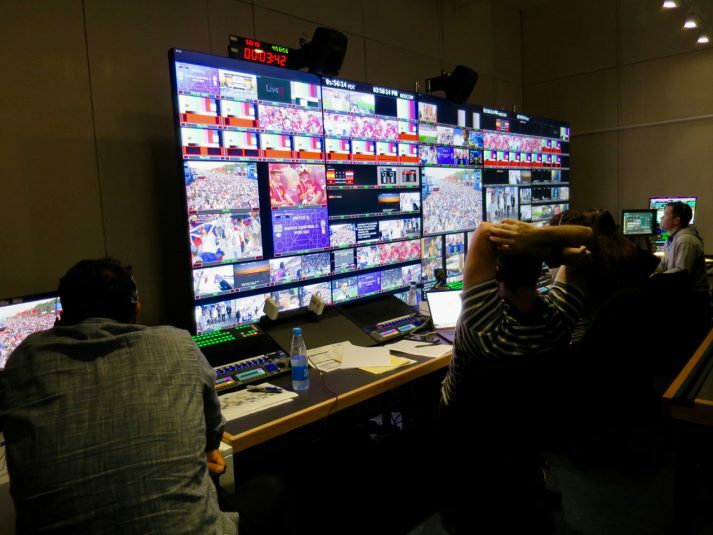 At the same time, they built a terrific venue at Red Square and environment for other broadcasters, so they really are flexible and take broadcasters’ needs in mind with their decision-making. FIFA is great that way, too. [CCO] Philippe LeFloc’h, [TV Services Director] Josh Smith (who is just a prince), and [Head of Broadcasting Services] Arnaud Le Mintier really care about what we’re doing because our success is their success. How have your teams in Los Angeles and here done in terms of staying on the same page? It’s a far-flung operation, and one of the things in TV that you enjoy is being able to sit, whether in a meeting room or a meal, with your colleagues and talent. Some of that is made more difficult by being 8,000 miles away from L.A., where the editing operations are, but that has been a trend for more than a decade. Even here, having the IBC not even 20 miles from Red Square is difficult. But we have Zoom so that everyone can see each other, and everybody has adapted to it very well. It’s not what everybody is accustomed to, but the technology is there. I look at the product that we are putting on the air, and I am as proud of this as anything I have ever done. I will admit to you that, in August, it will be 40 years since I have been in television (Don Ohlmeyer hired me in 1978). And I am as proud of this as anything I have been associated with, and a lot of it is because of what we have done, given some adverse circumstances, not the least of which is the U.S. not qualifying. Speaking of the U.S., before the tournament, it was announced that the U.S. will host the 2026 World Cup, and, in the days before that, there were some rumors that maybe Morocco could get those rights. How relieved were you when it went to the U.S.? We were very excited about it, and [Fox Sports President/COO/Executive Producer] Eric Shanks and I were at the FIFA Congress as invited guests. It was a strange feeling to be in a room where a decision was being made that would affect our company and we had nothing we could do but just sit there and watch it play out. It was a great result for us. The other thing is, it was a nice way to have U.S. soccer put back into the conversation in a positive way on the eve of the World Cup. That is as important as anything: just some positive news for U.S. soccer coming into this event. We have a few more matches left in this tournament, but it’s no rest for the weary with the Women’s World Cup in France coming next year. Planning is already under way, and we’re doing a live shot from our set location in Paris during the Final here to have a very fond look ahead to where we will be a year from now. Any final thoughts on World Cup 2018? This sport is its own culture and passion, and you hear it in our daily meetings, not only from the talent but the production people who love this sport. That love is reflected in our on-air product. Anybody who watches us for more than five minutes, whether they like our product or not, comes away with a sense that Fox Sports really, really loves soccer and the World Cup. I love that, and it is a great environment to be working in.